Service is a major part of my life. It's actually my 'why?' I try to make service the basis for everything I do. As you know, our Nation is currently mourning the loss of former President George H. W. Bush. About two years ago, I read a biography on him. I was so touched by his lifetime of service that I wrote him a thank you letter. That's not something I ordinarily do but his impact was that great. I was young when President Bush 41 was in office. Bill Clinton is really the first president I remember. What I knew about President Bush 41 came through Dana Carvey on Saturday Night Live. 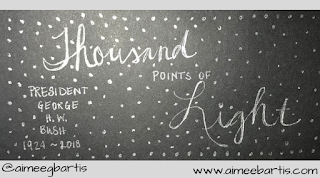 I do remember his call to be A Thousand Points of Light. I didn't have an idea what he meant but I remember hearing him say it. 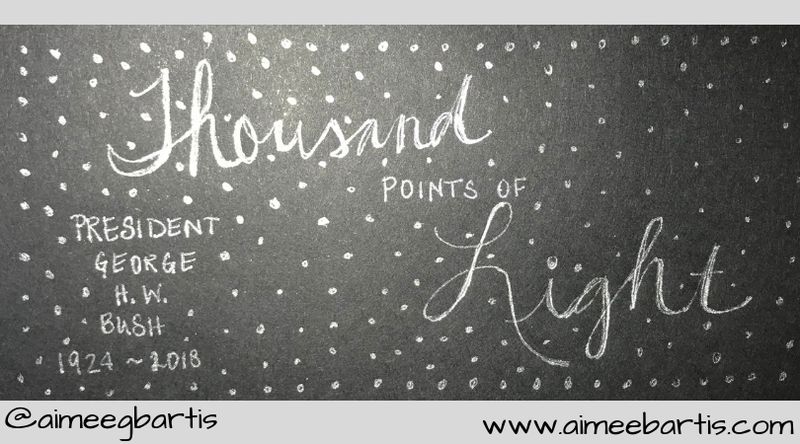 When I heard the news Saturday morning all I could think about was A Thousand Points of Light. I understand it now and it fits in with my why of service. A joke with one of sorority sisters is that we have to take a lot of pictures so there's lots of pictures for her funeral. As I watched President Bush's service, I thought I need to serve with a loving and graceful heart so that people will have nice things to say about me when I pass. Here's my favorite things that were said about President Bush or were attributed to him at his service. Hatred corrodes the container it's carried in. "We cannot hope only to leave our children a bigger car, a bigger bank account. We must hope to give them a sense of what it means to be a loyal friend; a loving parent; a citizen who leaves his home, his neighborhood, and town better than he found it. And what do we want the men and women who work with us to say when we're no longer there? That we were more driven to succeed than anyone around us? Or that we stopped to ask if a sick child had gotten better and stayed a moment there to trade a word of friendship?" President George H. W. Bush's inaugural address. Thank you for your service, Mr. President and may serve in a many worthy of your example.